Callaway has two new iron models for next season and both are in stores now. For professionals and low handicap amateurs there are the one-piece forged Apex Pro 16 with progressive center of gravity placement and a very pleasing headshape/top line designed with input from Callaway’s Tour staff. 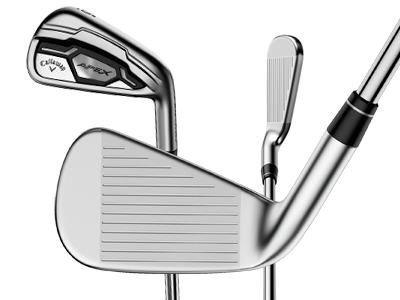 The second model, Apex CF 16, u pdates the Apex irons from two years ago and is considered by Callaway to be “a forged iron for all golfers.” In a first for the company’s forged irons there is a cupface construction in the long and mid-irons while the short irons (8- through wedges) have had the face plate redesigned. The set tested of 5-iron through A-wedge had True Temper XP 95 stiff shafts. Note: A cupface clubhead consists of two main pieces, the hosel and rear of the head welded to the face whose edges wrap around forming something like a cup. This construction leaves more of the face unsupported allowing for more flexing at impact and added ball speed. Several manufacturers make use of cupface construction for clubs including drivers and Callaway employ’s it in the XR, XR Pro and Big Bertha irons. The initial impression at address was favorable, the forged heads have a relatively thin topline and as to be expected there is more offset in the long irons that becomes progressively less down through the wedges. On the range before the first round it was evident how “easy” these were to hit and on the course this paid bonuses. Easy hitting in my experience includes the feel, forgiveness and whether the ball flies with the correct trajectory. These irons rate highly for each of those criteria. My conclusion is the combination of the flexibility in the face (which tends to increase launch angle), the way the clubhead is weighted and the fact the XP 95 shafts have a low to mid kick point all would help produce the nice high trajectory most of us like from our irons. Over the ten rounds trial the Apex CF 16s were excellent at digging the ball out from questionable lies such as those found in the Bermuda rough here in Florida. Ball spin appeared to be dependent on the type of ball used and two of the tour-type golf balls—one being Callaway’s Chrome Soft—had lots of stop, even spinning back on occasion which, as most golfers know, is difficult to do on Florida greens. The seven club set tested retails for $1049.99 and a set of eight (4-iron through A- wedge) is $1199.99, $200 more for graphite shafts. Negatives: On downwind shots, because of the ease at getting the ball airborne, the ball sometimes appeared to “float” and into the wind at least considering an extra club was a must. 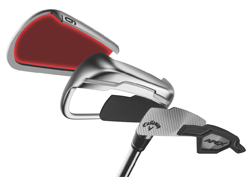 Pricing is at the upper end of the range for premium quality irons. Recommendation: Easy-to-hit is hard to beat and if evaluating new irons Callaway Apex CF 16s should be near the top of those you try.